Colourful magnet clips for home, office, storage, school, workshop, etc. 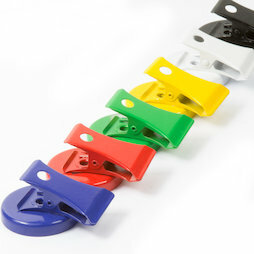 The set contains magnet clips in six different colours: blue, red, green, yellow, white and black. The embedded ferrite magnets feature a much lower adhesive force than neodymium magnets of the same size, but they provide a low-cost alternative when adhesive force is not crucial.